Alabaster is a mineral, usually referred to as the finely grained gypsum mineral. In fact, there are saying as there are two types of alabaster exist, one from fine-grained massive gypsum and another one from the fine-grained calcite. However, based on the reports suggested by the geologists, alabaster has referred to the particles of the fine-grained massive gypsum. In nature, the alabaster stone is lightly colored and looks almost transparent. Right from the ancient times, the alabaster stones are primarily used for creating decorative artifacts. Alabaster stones are mined as a rock and workshopped to make into small pieces. In general, these alabaster stones are formed at the bottom of the lake or ponds. The presence of gypsum deposits at the bottom of the water reservoir like lakes or ponds leads to the formation of alabaster stones when the water gets evaporated. The softness nature of the alabaster stones allows enables it to be nicely carved to manufacture various items, especially the decorative items. When looking into the Egyptian history the alabaster stone played a vital role and also in bible too alabaster stone referred to as Oriental alabaster. It is believed that the alabaster is in usage right from the 7th centuries. Archeologists had found various alabaster sculptures which are believed to be created during the 7th century and currently those are located in the British Museum. 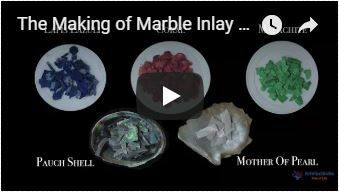 We Artefactindia one of the largest marble inlay product manufacturers prefers alabaster stones for manufacturing various decorative items. In most cases, the snow white alabaster stones are highly preferred to create statues, decorative sculpture, and can wisely use in the marble inlay products. To know more about our wide range of marble inlay products and to get price quotes to get in touch with our customer care support agent by dialing +919557221114.